Ards boss Colin Nixon is looking beyond the black and white and banking on rewards for his players’ positives arriving over time. Three defeats on the bounce have left Ards in an unenviable position so early within the league campaign - with newly-promoted Newry City AFC next to offer a test. “We have definitely been in each game for periods so far, despite our well-documented injury situation,” said Nixon. “It is early days still and we must stick together. “We are still waiting to hear about Sean Noble’s situation in terms of surgery and length of time. City manager Darren Mullen feels his players are learning to adapt to the senior stage. 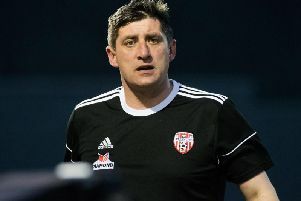 “I’m not one for moral victories, but I thought we deserved at least a draw out of the game against Glenavon,” he said. “We started brilliantly and for the first 20 minutes we were by far the better side. “The players ran themselves into the ground, that’s maybe small comfort but when the dust settles we can look back on it and we certainly haven’t looked out of place against a top-six side. “We should have had something and even (Glenavon manager) Gary Hamilton at the end when we were coming off said we were the better side. “We just have to forget about it now and take the positives out of it, because there certainly are positives.